Age 95. Born March 30, 1921 in Toronto, Canada. Died July 12, 2016 in Redmond, Washington. 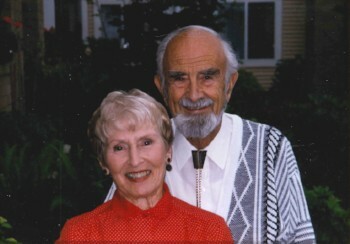 She and her husband of 58 years, Hugh Thompson, lived in the Seattle area from the early 1950s and in Redmond since 1963. Audrey Mason was born into a family of strong women. Her grandmother was widowed at an early age, and with the help of her two daughters, made a living for the family in Toronto by buying older, neglected homes and fixing them up for resale. While still in her teens, her mother Muriel married Cecil, a survivor as a Canadian soldier of World War I and a baker. Audrey was their only child. They continued to live with Audrey’s grandmother and aunt in a tight-knit family. Audrey met Hugh Thompson at a corn and wienie roast on Halloween 1936. They didn’t start out the evening together, but they went home together and immediately began competing against each other for the best grades in high school, always near the top of their class. Their competition grew into a courtship and they were married in April 1941. Two their favorite songs during this time were “Red Sails in the Sunset” and “Harbor Lights” as Hugh was working on cruise ships on Lake Ontario. He found ways to bring Audrey along on moonlight dance cruises and to squire her around the dance floor when his official duties permitted. 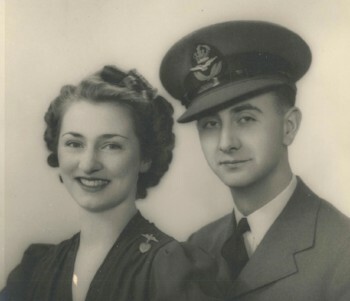 About six months after their marriage, Hugh left for Europe and northern Africa as part of the Canadian Air Force. He was gone for three-and- a-half years. 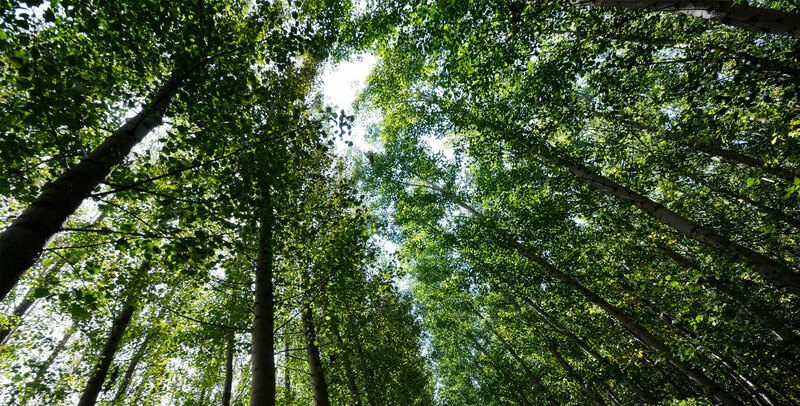 The challenges continued for Audrey as her father died in 1942 from tuberculosis, caused by exposure to mustard gas during the First World War. She did not let these setbacks stop her. 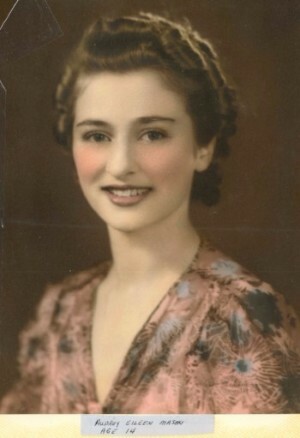 After successfully finding employment as a legal secretary in Toronto, and developing a reputation as a speed typist, she followed her aunt to Vancouver. There she joined the war effort as a Rosie the Riveter, but became frustrated when her co-worker, a man, worked too slowly for her liking. When Hugh returned in the spring of 1945, they soon moved to Vancouver Island where he worked for B. C. Power installing the first electrical lines on the island outside of Victoria. They moved regularly to new towns up island, staying until the public power arrived, before moving onto the next town. 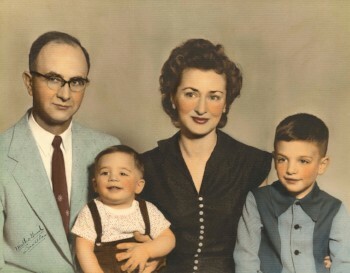 Their first son Barry was born in Nanaimo in 1947. As the work reached completion, they looked for other work, including a potential venture with distant relatives in Sydney, Australia. This required a slow boat journey with a six-month old baby, and then the equally slow return when the venture proved unsuccessful. Eventually they ended up in Seattle where second son Brian was born in 1953. Soon after, they spent a year in Ketchikan, Alaska while Hugh did the first ever assessment of all the properties in town in anticipation of statehood. While this work would not endear them to the residents who had previously lived tax free, Hugh and Audrey still made many long-term friends during this stay and returned to southeast Alaska frequently over the years. In 1963, Audrey managed the family move to Redmond while Hugh was convalescing in hospital from a mild heart attack, organizing Barry’s scout troop to be the muscle behind the move. Soon after her grandmother, her mother and her second husband, and her aunt were made homeless. Audrey rescued them from where they had been living in northern California and somehow found a place for all (plus her recovering husband and two growing sons) in a house with two bedrooms and only one bathroom. After many years of working for others, Hugh and Audrey decided it was time to work for themselves, establishing in the mid-1960s an industrial and commercial real estate appraisal company names Hugh A. Thompson and Associates, Inc. This would be the work that they would retire from, some 25 years later. In addition to running the office side of the business, Audrey became actively involved in the community. She joined the board of the Redmond Chamber of Commerce and was president in 1977. She and Hugh went on a trade mission to Asia with congressman Rod Chandler. Together, they were early volunteers with the Redmond Rotary RedSpoke bicycle ride from Redmond to Spokane, driving their motor home to provide respite for tired cyclists. During this time, Hugh and Audrey maintained a home in Akumal, Mexico, and later El Mirage, Arizona. In 1994, they moved into Emerald Heights retirement center in Redmond, which was to be their final home. Audrey maintained her energy and interest in trying new things after Hugh’s death by becoming active in lawn bowling and volunteering in the community coffee shop. 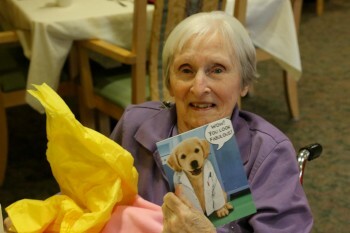 Her family is especially grateful to the staff of the Corwin Center at Emerald Heights for their help during her last eight years, and to Evergreen Hospice for their support during the last year. Audrey was preceded in death by Hugh (1999) and their son Barry Thompson (2015). She is survived by son Brian Thompson (Jim), her grandchildren Steven Thompson, Christopher George (Yolanda), and Lauren George (Cody), and her daughter-in- law Ann George. She also enjoyed special friendships in recent years with Jack Henry and Ellen Lamb. A celebration of her life will be held at Emerald Heights Retirement Center (10901 176th Circle NE, Redmond, WA 98052; 425-556- 8100) on Friday, August 12, 2016 from 2-4 p.m. Dress is festive casual. Please jot down and bring a story you fondly remember about Audrey, or share it on this website. Hospice c/o Evergreen Health Foundation – 12040 NE 128 th St. MS #5; Kirkland, WA 98034-3098.